Mount Adams, third-highest summit in the Cascade Range at 12,326 feet, rises above the Gifford Pinchot National Forest; Adams forms the towering backdrop for a scenic and recreational wilderness area. 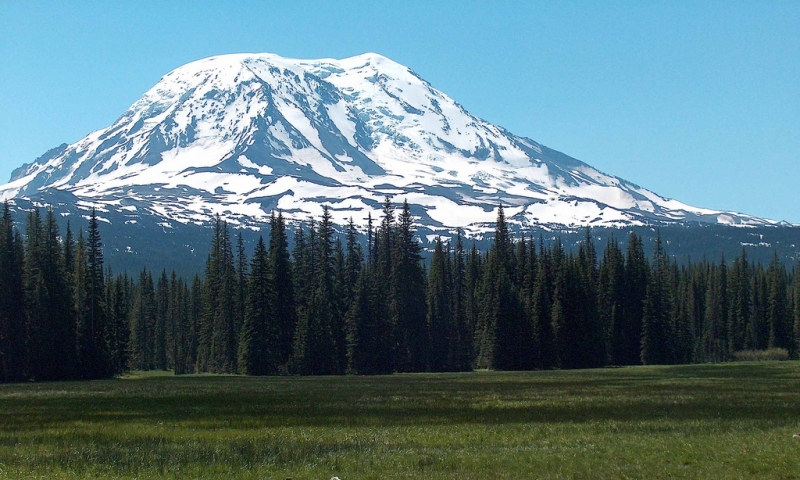 Mount Adams is the third-highest mountain in the Cascade Range at 12,326 feet. Some mountaineers consider Adams the best climbing area in Washington State. Hiking, camping, water sports, skiing, and other recreation are enjoyed on and around Mount Adams. Scenic Mount Adams, one of the dormant volcanoes in the massive Cascade Range, can be viewed from the Columbia River Gorge on a clear day. Its peak is second-highest in the state of Washington and third-highest in the Cascades. The mountain is surrounded by the Gifford Pinchot National Forest, a portion of which was designated the Mount Adams Wilderness Area in 1964. Some mountaineers consider Mount Adams the best climbing area in Washington, and many climbers attempt to scale her summit each year. Close to 900 miles of trails cross the Mount Adams Wilderness and the Pacific Crest Trail traverses Mount Adams’s flank. Mount Adams is located in southwestern Washington in the Gifford Pinchot National Forest. Reach the mountain via State Highway 141 North of Highway 14 (Lewis & Clark Highway) toward Trout Lake. Mountain Climbing. The South Spur route up Mount Adams is easiest and most popular, and can be done in 1-2 days with ice axe and crampons; the North Ridge route is second most popular. Hiking, Camping, and Backpacking. Nearly 900 miles of trail network across the Mount Adams Wilderness, and every level of hiker or backpacker can find a suitable trail. Many campgrounds, from primitive to modern, dot the Gifford Pinchot National Forest. Water Sports. Rivers, lakes, and waterfalls abound in the area surrounding Mt. Adams, for fishing, boating, and whitewater rafting. Backcountry and Cross-country Skiing. Mount Adams, like many of the Cascades, is a glacial volcano, and ski mountaineers enjoy the backcountry routes down her slopes. Mount Whitney is the highest peak in California, and the lower US.